As talk hots up that Zinedine Zidane has been approached over replacing Jose Mourinho as manager of Manchester United, we thought we’d take a look at the players who’ve been linked as transfer targets for the Frenchman so far. 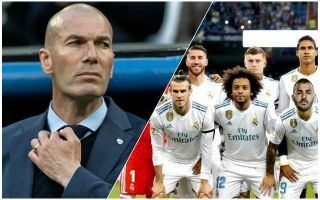 Speculation has been going on for some time now that Zidane could make his way to United after leaving Real Madrid in the summer, and after a dreadful start to the 2018/19 campaign under Mourinho. After a 3-1 defeat at West Ham on Saturday, it’s little surprise to see the Zidane rumours and Mourinho sack talk coming up again, with various stories doing the rounds in the last few hours. First up, beIN Sports claimed United had made initial contact with the former Real Madrid boss about taking the job at Old Trafford, and tomorrow’s Mail back page claims MUFC players and staff believe Mourinho could be gone by the end of the week. So, if the change does happen, who could Zidane try to bring in for the Red Devils, who clearly need some work doing in the transfer market, as well as in the dugout. Here’s a look at ten players who’ve been linked as potential targets for the 46-year-old in recent weeks, and while we obviously don’t expect all of them to come in, it does perhaps give some idea of what the new man in charge might be looking for for when he lands the job. First up, a recent report from Don Balon mentioned interest from Zidane in raiding his old club Real Madrid for Raphael Varane and Karim Benzema. We’re not sure the Benzema link makes much sense given the Frenchman’s age and poor recent scoring record, though he was something of a key figure for his work rate up front and unselfish play during Zidane’s time at the Bernabeu. Raphael Varane to Manchester United under Zinedine Zidane? Varane, of course, is one of the best centre-backs in the world and a clear upgrade on what United currently have in that position. As well as that, the Daily Mirror have previously claimed Madrid midfielder Toni Kroos could also be a target. The Germany international’s fine range of passing and experience of winning surely mean he’d be ideal to come in as an upgrade on struggling, unconvincing performers like Paul Pogba and Marouane Fellaini.